Welcome to Mark Pastin’s web site. You will find information about Mark and his publications, services and speaking engagements here. Mark started working on ethics and compliance problems in business, government and the professions in the early 1970s. His 1986 book, The Hard Problems of Management: Gaining the Ethics Edge, was the first to take a managerial approach to ethics in business. (See Publications for details.) In his new book, Mark shows readers how to use their own innate ethical sense to create organizational and social change. 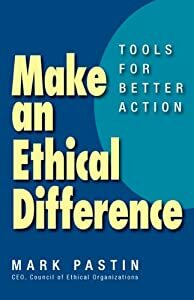 Make an Ethical Difference: Tools for Better Action was released late in 2013 and is available now at Amazon.com and Berrett-Koehler Publishers.